I stamped the stripes (Papertrey Faux Ribbon) using each piece of my Spectrum Kaleidecolor ink pad. The gift image is from My Stamp Box. (don't forget there's still a few hours to play along with this week's CASology Cue Card - Gift)! I'm hoping for a little more crafting time in my craft room on Sunday, but after the hurricane of making over 200 cards for various people last week, what it really needs is a good tidy up! Love, love the shine on the focal image! Super card! Wow, love the offset gift image (very retro) and the colour combo is fab! This card is super duper RAD!! Fabulous card, Ardyth! That embossing looks divine! I think I "need" that faux ribbon stamp. Thank you for enabling ;) Lol! Hope you are doing well! Sending hugs your way! Love those bright stripes, Ardyth! 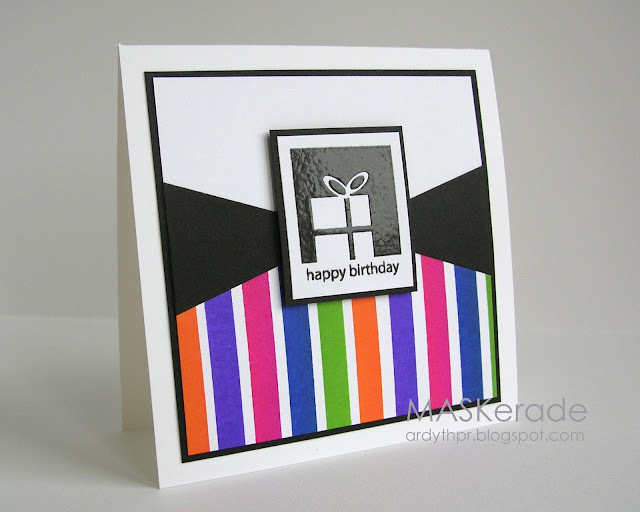 Your bright and bold colours with the black embossing are just so funky. Love this card. I absolutely love how you worked this sketch! Flipping the sketch gives is a completely different look. You have incorporation so many clever interpretations - especially love the solid black panels in place of the string. Wow love this take on the sketch. The colours are just divine together and I love the embossing. Thanks for sharing your take on this weeks sketch at Unscripted Sketches. Fabulous interpretation of the sketch! Thanks for playing at Unscripted Sketches! Love those cheerful pops of color ... so glad you joined us at Unscripted Sketches. wonderful take on this week's sketch! I love the embossed image and the colors. Thank you for joining us at Unscripted Sketches. lovely! Such a great pop of color on the bottom!